We at Leicester Tigers hope that you are all looking forward to your well-deserved summer break after another school year! This year we have a couple of campaigns that we would like to recommend to you; our summer Rugby Camps and our Season Tickets for the 17/18 season. As you may know, in recent seasons we put on school offers at certain games, we hope you have managed to take advantage of these offers and enjoyed your visits to Welford Road. For the 17/18 season we would love for you to join us as a season ticket holder and wanted to let you know that children under the age of 10 as of the 1st September 2017 are entitled to a FREE season ticket in selected areas of the ground. If over the age of 10, junior season tickets start at less than £6.50 per game. 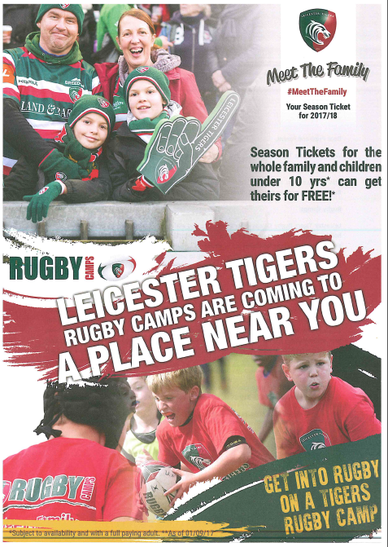 We also have have great family offers which combine adult and junior season tickets , a fantastic way to spend some family time at Welford Road. Have a great summer, we hope to see you soon!